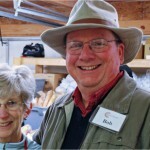 The Bread for Life Community Food Pantry is an ecumenical food ministry run by members of more than 10 local churches. It is the vision of Fr. James Cowles, Pastor of the Church of St. Therese in Gloucester, Virginia. He had an empty 2-car garage on the property and realizing the great need in the community, approached Deanna Cobb of St Therese with his vision. Under her leadership and the skilled efforts of many volunteers a part of the garage was converted to a very efficient center for storing and distributing food. 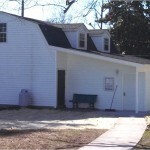 The new food pantry opened its doors on March 19, 2009 to serve 13 families. In the following months the pantry was expanded to include the entire garage. In October of 2010, Deanna Cobb turned over leadership of the pantry to Bob and Susan Quinzel. The pantry has grown to become one of the largest food assistance programs in all of Hampton Roads. In the fall of 2013 an addition was added to the building. The new space is used entirely for “Client Choice” food distributions. Instead of prepackaging bags, food is displayed on a long counter and clients choose the foods they need and know their families will eat. The old pantry is used entirely for storage including a new walk-in freezer. 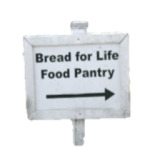 Bread for Life is open for distribution 3 days a week, Mondays and Fridays from 10am-1pm and on Wednesdays from 2pm-5pm. New and former clients are welcomed to park in the St Therese parking lot. Follow the rear path to the pantry. Clients check-in and are then welcome to select from the display of frozen meats, produce, cans, dry goods, breads and other bakery products. During the 2nd and 3rd full weeks of each month, USDA TEFAP food is also available. The Emergency Food Assistance Program allows eligible recipients to receive an additional food distribution once every month from one pantry. TEFAP food varies from month to month but usually consists of cans, shelf stable milk or juice and frozen meat products. Bread for Life is an independent non-profit 501 (c) (3) corporation. We are an agency member of The Foodbank of the Virginia Peninsula. We shop at the FoodBank warehouse and participate in their “Managers’ Bread Plus Program and their Neighbor to Neighbor food rescue program. We actively collect food from churches, local merchants and individuals. During the summer months BFL volunteers glean local fields to harvest corn and other fresh crops.